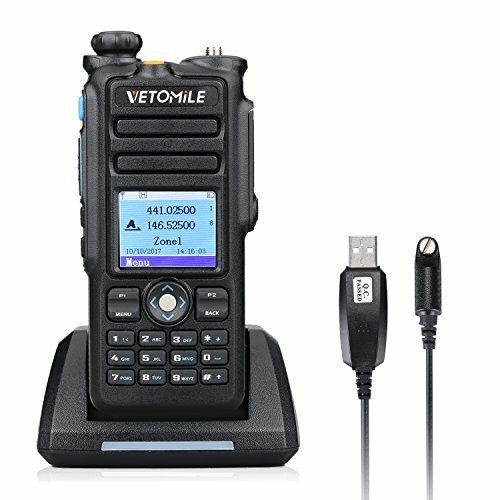 Enter the dual band digital age in the style with VETOMILE V-2017 Digital Portable Two Way Radio! It uses Digital Mobile Radio Tier 2 Standard protocol and compatible with any existing analog two-way radio operating on the supported UHF and VHF frequencies for easy migration to digital technology. It is definitely the most affordable and BEST way to join the fun of dual band technology for any application. Programming software is suitable for Windows only. Software can be downloaded on VETOMILE official website. Software upgrading for new functions is life-time free. Using Time-Division Multi-Access (TDMA) digital technology, with digital protocol ETSI TS 102 361-1, -2, -3; and compatible with Mototrbo Tier I & II. VHF 136-174MHZ and UHF 400-480MHz, Digital and Analogue mode(programmed by software). Dual wait, dual standby, and dual time slot for repeaters. With 2200mAh Li-ion rechargeable battery, support 9-12 hours used, about 55 hours of standby time. Up to 6.2 miles range communication under various environment such as urban area, mountain and lake. The function with GPS and can release a emergency call even the walkie-talkie is busy in transferring and receiving. Rugged construction to be IP67 compliant. Submerged in water up to 1m for 30 minutes. Vetomile offer one year warranty and life long friendly customer service.